You might think I'm mad but...: [It's] creepy and [it's] kooky, mysterious and spooky, [it's] all together ooky, Hallowe'en! [It's] creepy and [it's] kooky, mysterious and spooky, [it's] all together ooky, Hallowe'en! When we were kids, our mam would dress us all alike for the holiday - 7 pirates or headless horsemen would walk fearlessly down the street visiting all the neighbours. Our costumes ranged from shepherds, when there were only three of us, to a Chinese Dragon with the littlest one being pushed in the buggy. We'd great fun and all the older neighbours loved us coming by and would ply us with crisps, chocolate, peanuts and fruit. Although I am a chocolate nut (pun intended), my favourite things were the pears, apples and mandarin oranges. These would last us the week and, because of the season, were so sweet and delicious. We used to give up chocolate for the month of November, so Hallowe'en night culminated in a mouthwatering feast. Photo courtesty of my mother. We'd eat and eat and eat chocolate and crisps, play musical chairs, bob for apples or pennies and trying to bite the swinging apple. One year we added the game where you have to pass a ball or orange around using no hands. We'd seen this in Charade, starring Cary Grant and Audrey Hepburn, and we were dying to try it. For some reason for a few years I hated Hallowe'en - I think it was because I was at that age and also because I was the oldest kid I knew who still dressed up for Hallowe'en. I think I felt awkward and out of place. I think when I really started to look at Hallowe'en as something to enjoy again was the year my brother-in-law turned 25. His birthday is in October, so the weekend of his birthday he had a fancy dress party at his house. Everyone milled around in costumes ranging from the Phantom to Bosco (a beloved Irish TV puppet). I went as Dr Quin, Medicine Woman.It was a great night and a lot of fun. Although it wasn't Hallowe'en it made me realise that I liked dressing up! Also, a friend of mine hosted Hallowe'en parties for her friends two years running. The first year, she and I had been in Edinburgh at the start of October and she was able to pick up some Hallowe'en items. I'd also been wandering around some of the charity shops (think Thrift stores, American readers) and came across some old silver candlesticks for her. 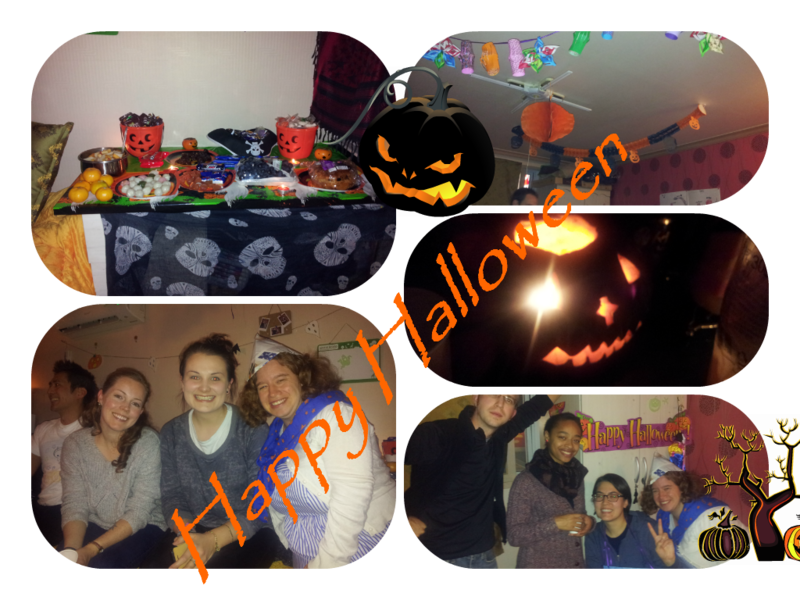 Her Hallowe'en get-together was fantastic. She made a really fancy, delicious meal and everyone was dressed up as witches, burlesque girls, or gypsy fortune tellers. The following year, instead of a sit-down meal we had nibbles and wine, a much larger gathering and lots of laughs. That year I was the goddess Gaia and we had a lot of vampires, devils, queens and sailors. Thanks to my friend's great love of all that's spooky, my appreciation for Hallowe'en increased. 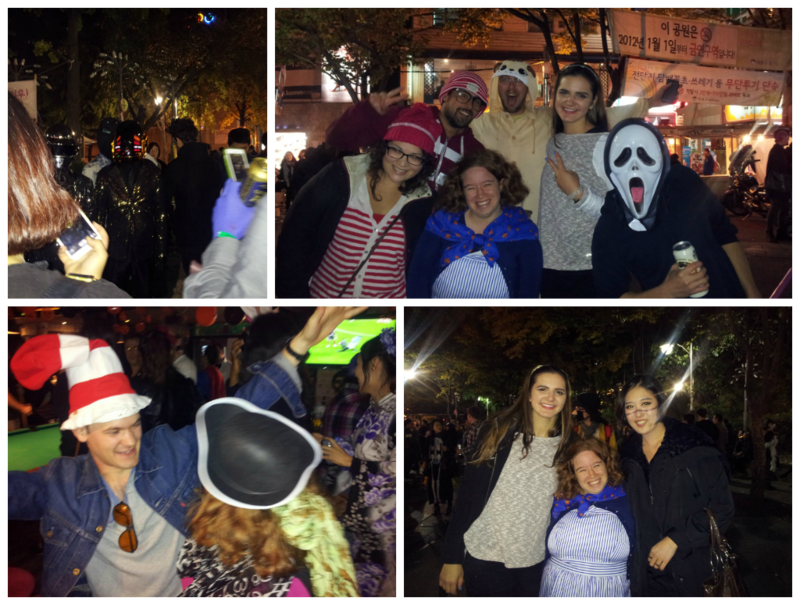 When I came to Korea, I was delighted to find out that on the Saturday around Hallowe'en people do usually dress up and go out drinking. There is even a zombie walk for those who want to participate. I saw some people with incredible, terrifying and realistic costumes from this event. Seriously, I was so creeped out! I think Zombies creep me out more than any other Hallowe'en character. (Yuck! Even writing about them gives me the heebie jeebies.) On the night in question, myself and some friends went to Hongdae. One of my friends dressed all in black except for a mouth mask that was purple. She looked really mysterious and like a burglar! I met up with several friends who ranged from doing the Korean "Matchy" cute couple to an Egyptian Princess and Mummy. We even had a Katniss from Hunger Games! The highlight of my night was meeting a guy who was the spitting image of Neil Patrick Harris (Barney Stinson from How I met your mother)! I even got to kiss him (on the cheek)! 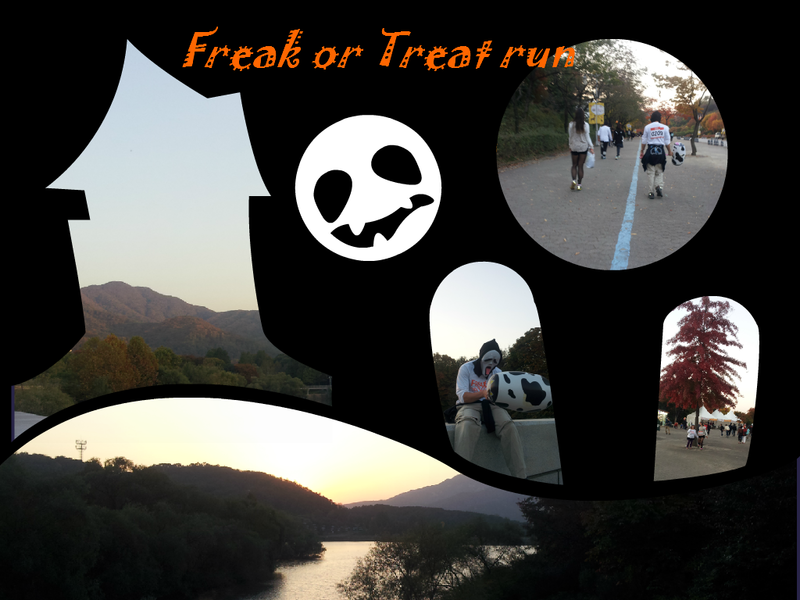 For this Hallowe'en, I decided to participate in a 5K walk/run called "Freak or Treat". It took place at Seoul Zoo and was in aid of Childfund. You could dress up or you could just use their t-shirt. I decided to just use the T-shirt as I'd much prefer to be WARM than dress up for this event! My brother and two friends went on the walk. I think we must have missed a turn somewhere because we were finished in maximum 30 minutes and that includes lots of photo stops! Afterwards, my brother and I checked in at our hostel and then proceeded to Hongdae for the annual get-together. There were a lot of superheroes, some people dressed as Daft Punk and even an adjumma zombie. I think, Daft Punk, Iron Man and Captain America must have spent a small fortune on their costumes they were that elaborate! I went as a sailor...except I forgot to make a hat so I think I just looked dressed up! My brother didn't have a mask yet and one friend went as a dancing Scream Ghost and another as a Korean Pop-Star. My friends who went as the "matchy" couple last year were Wally and Wanda (from Where's Waldo?/Where's Wally?). Actual Hallowe'en was spent lying in as my school let me take a holiday-day as my brother is visiting. I then got up at 8.30 and started cooking and cleaning for the pot-luck dinner. A bunch of friends, new and old, came over for dinner and some even got into the spirit of Hallowe'en and dressed up. All in all it was great night and although I was exhausted by the end of the evening, I was really glad that I hosted this event. My brother was amazing and helped me re-arrange my apartment in a much more spacious manner. 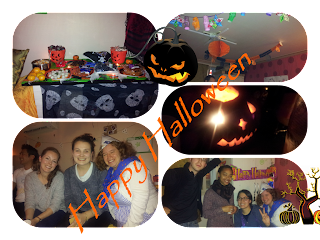 The food was amazing, the company even better and a lot of people left tons of candy which I shared out amongst my students at my 2nd school for our Hallowe'en party there. All photos this year except top left. Last year, I had 10 different Hallowe'en parties between my two schools! This year, I only had 6 and they were all in one school. Last year we made masks and I taught the students to use the "Trick or Treat" chant. This year, two weeks before the event I told my students about it and charged my students with making costumes and decorations for the classroom. I had told my mam about doing a class on Hallowe'en so she sent me lots of decorations and I still had some leftover from last year. I had also requested some photos from my family and my students had fun trying to guess which one was me! My brother brought over lots of Irish sweets and between that and the leftover candy from my party the previous night, the students were "sweet-ed out". 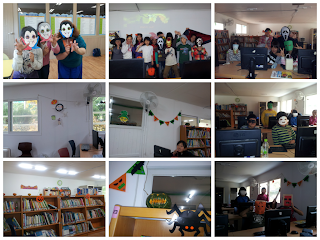 I split our class between our regular lesson and a Hallowe'en theme. The students seemed to really enjoy the day and were really impressed with all the Irish sweets! So you might think I'm mad to love Hallowe'en as much as I do, especially considering scary movies are not my thing. You might think I'm mad to continue dressing up even though I am now over 30 and you might think I'm mad to celebrate Hallowe'en 6 times in the space of 1 day! For this last one, I completely understand anyone's viewpoint on this - but as an English teacher the greatest lessons I can teach my students are the ones that reflect my culture. Hallowe'en is a traditional Celtic Holiday and has had a major impact on Irish cultural history and traditions, some of which persist to today. Whilst I don't intend to celebrate Hallowe'en every year with my students, it is important that they are exposed to this holiday, if only to let them find new ways of exploring English. PS This post is inspired by my love of Halloween and The Addams Family theme song. Thanks so much! Sorry, I don't know your name but I really appreciate your feedback!